Last week’s package of changes that Facebook rolled out are causing a bit of an uproar. Any time Facebook makes changes, it’s very stressful to people who don’t like change. That being said, this time the changes are mostly beneficial to everyone. Lots of folks are clamoring to be the first/best tutorial on the new updates. 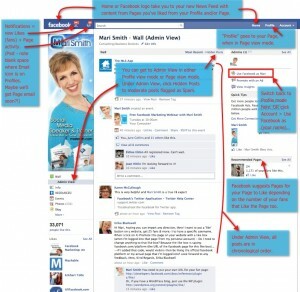 I don’t happen to be one of those folks, so I wanted to direct you to a post by Mari Smith, one of the most visible online personalities related to the workings of Facebook. Her post reviews most of the updates to Facebook Pages. One of the biggest changes she doesn’t get into is the phasing out of FBML in favor of iframes. This refers to the way to make a FB page look similar to a regular web page – you’ll see them used to present nice graphics in a ‘landing page’ style. 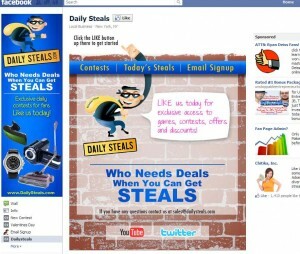 Here’s an example of one from a page called Daily Steals. The reason Mari doesn’t get into this is because it’s not a topic for basic Facebook users. It’s not too awfully complex, but it does involve creating a web page and creating a facebook app to import it. For the nitty gritty on that process, check out this article. These new Facebook pages are not optional. They’re to be in effect across the board starting March 11. Pay attention to the Facebook pages you like and notice what they do to increase likes, connect with their readership, and how they integrate facebook into their overall online strategy. Anything you see someone doing on FB, you can do too… at least for now!